Three Microprose classics landed on Steam last night, travelling through the time tubes, forward into our era. If you feel like being slapped in the face by some old Sid Meier fare, then you can grab Colonization, Pirates! and Covert Action. Covert Action is the most novel of the bunch, as it’s the only member of the trio not to receive a modern makeover. It’s also the only one I haven’t played, which is why I decided to delve into the murky world of ‘90s espionage. Stepping into the government issue shoes of Max Remington also means stepping back in time. The Cold War is over, but it’s still fresh with plots and paranoia fuelling intelligence agencies all over the world. 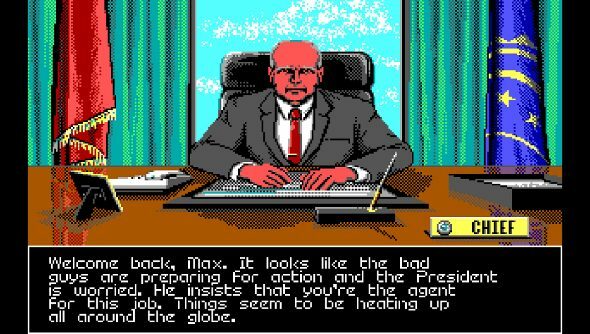 While it’s old and a bit fiddly, Covert Action still stands out, lacking any real modern analogues. It’s a spy sim, where each new game builds plots that can go in all sorts of directions. In the video above, I was tasked with stopping a plot to steal the President’s ultra double top secret code book, which led me to a Stassi hideout in Washington D.C., where I struggled to walk through doors. Other plots sent me gallivanting across the globe in search of criminal masterminds and precious intel, tailing foreign agents in my car, tapping the phones of their secret bases, bursting in and interrogating terrorists – all the delightfully shady, not at all legal things that spies tend to get up to. At its heart, though, Covert Action is all about being a nosey bugger. A big snoop. Information is key, and all of the activities focus on gaining new intel to use against enemies and halt their un-American plots. Dossiers get built up as snippets of intel start to paint a bigger picture. A single photograph can unravel an entire plot, while others might be more involved, requiring missions all over the world. While CIA contacts provide guidance, it’s an open game, and its possible to immediately jump on a plane and go to a foreign city in an attempt to drum up new leads, ones that your contacts don’t already know about. Of course, that might lead to discovering nothing at all, and the plot will unfold and the CIA will be extremely disappointed. As fun as they can be, it’s unfortunate that we have so many Splinter Cell games while Covert Action didn’t spawn any sequels or even a remake. This is a proper spy game, even though it lets you be a properly rubbish spy.